Whether it is a data center relocation, consolidation or a comprehensive hybrid transformation including cloud, DR and tech refresh – TDS has the team, tools and expertise to accelerate success. Maintain your full IT asset inventory and recovery run book scenarios in TransitionManager. Use for ongoing architecture, testing / validation and event based restoration. Also enables quick remediation for edge case failure recovery. TransitionManager software accelerates and orchestrates I&O transformations. Enables faster project velocity and the ability to manage perpetual change. Transcends operating silos for a comprehensive view. TransitionManager is a collaborative, web-based software suite that simplifies and streamlines the overall execution of complex transformation initiatives. TransitionManager provides a cross silo asset inventory (virtual and physical), the ability to visualize complex relationships / dependencies (application, infrastructure and compliance), templated workflows with real-time execution and full command and communication center to assure smooth migrations. The 2018 Gartner Market Guide includes products from 40 different vendors designed to support IT resilience. With that many solutions out there, it begs the question – how can all these solutions work in concert to achieve IT resilience? Navigating data center migration projects can be difficult, and missing a step could cause complications. Download our Survival Guide to learn best practices on how to complete a successful data center migration. TransitionManager is specially built to orchestrate complex data center and hybrid cloud migrations and establish a dynamic, resilient IT environment. See how TransitionManager accelerates data center, cloud and hybrid IT migrations. The TDS team has more than 15 years of experience managing complex IT and data center migrations. 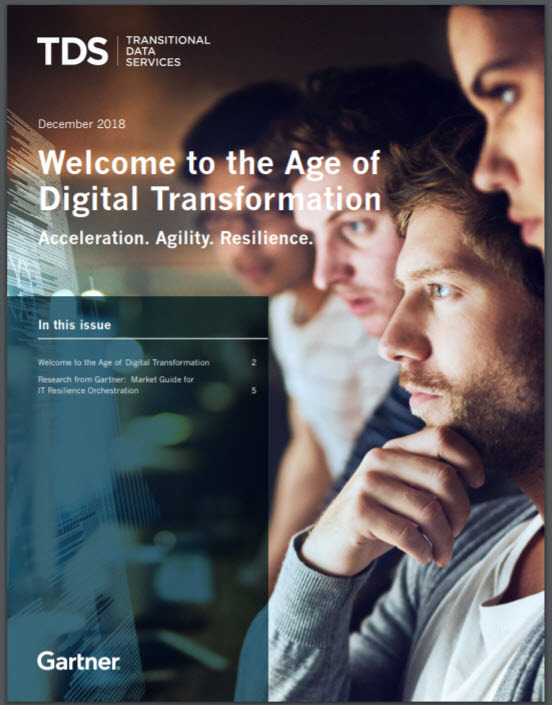 Read our blog for unique insights on the most pressing issues confronting the complex IT landscape.